Ron Palillo, the actor who starred alongside John Travolta on the 70s sitcom ‘Welcome Back, Kotter,’ died suddenly early Tuesday morning. TMZ reports Palillo’s longtime partner Joseph Gramm found him unresponsive in their Palm Beach, Florida home around 4 a.m. The 63-year-old was pronounced dead at a nearby hospital. It appears he suffered a heart attack. No other details were immediately available. With Palillo’s death, Travolta and Hilton-Jacobs are now the only surviving “Sweathogs” from ‘Welcome Back, Kotter.’ Hegyes died of a heart attack in January. TV Land is proud to announce that Golden Globe® winner and two-time Academy Award® nominee John Travolta will reunite with the cast of Welcome Back, Kotter at the TV Land Awards 2011. The network will salute the beloved sitcom – set in Brooklyn, NY – with the 35th Anniversary Award at this year’s show taping in New York City at the Jacob K. Javits Convention Center on Sunday, April 10 and airing on TV Land on Sunday, April 17, 2011 at 9 p.m. ET/PT. Travolta will reunite with co-stars Lawrence Hilton-Jacobs, Ron Palillo and Marcia Strassman – with more cast members to be announced – to accept the 35th Anniversary Award for the popular edgy sitcom which ran from 1975-1979. 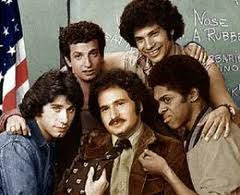 Welcome Back, Kotter ran for five seasons and revolved around an inner-city high school teacher, Mr. Kotter (Gabe Kaplan) who returns to his alma mater to teach a new generation of under-achieving misfits nicknamed the “Sweathogs.” As a former “Sweathog” himself, Kotter uses his own life experiences to try and get through to this misunderstood group led by wisecracking Vinnie Barbarino (Travolta). The talented cast is rounded out by Lawrence Hilton-Jacobs as Freddie “Boom Boom” Washington, Ron Palillo as Arnold Horshack, Robert Hegyes as Juan Epstein and Marcia Strassman as Mr. Kotter’s wife, Julie. Now in its ninth year, the TV Land Awards 2011 pays tribute to classic and contemporary luminaries of television, music and movies. The ninety-minute telecast will feature exhilarating musical performances and will reunite some of the most iconic celebrity TV casts. Previously announced honorees include Regis Philbin (Legend Award), Family Ties (Fan Favorite Award) and The Cosby Show (Impact Award).